Bangkok (Thailand) – July 27, 2018 (travelindex.com) – Centara Hotels and Resorts, Thailand’s leading hotel group, and Nakheel, UAE-based master developer today cemented their joint venture with a construction contract worth 2.63 billion to build a 601-room beachfront resort at Dubai’s Deira Islands. The new property, Centara Deira Islands Beach Resort Dubai, is Centara’s first in the UAE and will open in 2020. The resort is expected to significantly boost the emirate’s four-star accommodation – the fastest-growing segment in 2017 with a 10 per cent growth rate last year, more than any other hotel category – in line with the increase in popularity of Dubai as a tourism hotspot. Centara entered the Middle East market with the opening of Centara Muscat Hotel last year, and has additional imminent openings in other Gulf States. 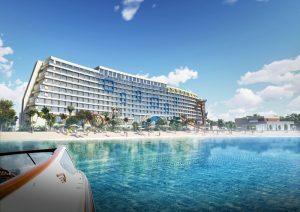 Located on a prime beachfront spot at Nakheel’s Deira Islands waterfront city, Centara Deira Islands Beach Resort Dubai will be managed by Centara, whose growing portfolio already includes over 12,000 keys across 60 hotels and resorts in Asia, the Indian Ocean and the Middle East. The family-centric resort will feature a waterpark, multiple restaurants including indoor, alfresco and rooftop options, kids’ clubs, spa and diverse family entertainment options. The 601 sea-view and city-facing rooms will cover a range of categories from standard and deluxe rooms through to expansive duplexes and suites and there will be a strong emphasis on family-centric accommodation. 114 rooms will feature bunk beds and approximately 90% of the rooms will be connectable, ensuring optimal options and comfort for families of all sizes. Centara Hotels & Resorts is Thailand’s leading hotel operator. Its 60 properties span all major Thai destinations plus the Maldives, Sri Lanka, Vietnam, Laos, China, Oman, Qatar and the UAE. Centara’s portfolio comprises six brands – Centara Grand Hotels & Resorts, Centara Hotels & Resorts, Centara Boutique Collection, Centra by Centara, Centara Residences & Suites and COSI Hotels – ranging from 5-star city hotels and luxurious island retreats to family resorts and affordable lifestyle concepts supported by innovative technology. It also operates state-of-the-art convention centres and has its own award-winning spa brand, Cenvaree. Throughout the collection, Centara delivers and celebrates the hospitality and values Thailand is famous for including gracious service, exceptional food, pampering spas and the importance of families. Centara’s distinctive culture and diversity of formats allow it to serve and satisfy travellers of nearly every age and lifestyle. Over the next five years Centara aims to double its size with additional properties in Thailand and new international markets, while spreading its footprint into new continents and market niches. As Centara continues to expand, a growing base of loyal customers will find the company’s unique style of hospitality in more locations. Centara’s global loyalty programme, Centara The1 Card, reinforces their loyalty with rewards, privileges and special member pricing. Nakheel is one of the world’s leading developers and a major contributor to realizing the vision of Dubai for the 21st century: to create a world class destination for living, business and tourism. Nakheel continues to deliver and enhance an iconic portfolio of innovative landmark projects in Dubai across the residential, retail, hospitality and leisure sectors. Our master developments include Palm Jumeirah, The World, Deira Islands, Jumeirah Islands, Jumeirah Village, Jumeirah Park, Jumeirah Heights, The Gardens, Discovery Gardens, Al Furjan, Warsan Village, Dragon City, International City, Jebel Ali Gardens and Nad Al Sheba. Together, these span more than 15,000 hectares and currently provide homes for over 270,000 people. Nakheel has more than 24,000 residential units under construction or in the pipeline. Nakheel’s current and future retail project portfolio covers 17.3 million square feet of leasable space. Developments include Ibn Battuta Mall, Dragon Mart 1 and 2, Golden Mile Galleria, Nakheel Mall, The Pointe, Deira Mall, Deira Islands Night Souk, Warsan Souk, Al Khail Avenue, The Circle Mall, Nad Al Sheba Mall and Discovery Gardens Mall, as well as major extensions to Dragon Mart (renamed Dragon City) and Ibn Battuta Mall. The retail profile also includes several neighbourhood community centres, known as Nakheel Pavilions. Our growing hospitality project portfolio comprises 17 hotels and serviced apartment developments with nearly 6,000 rooms and hotel apartments between them at various locations in Dubai, including Palm Jumeirah, Deira Islands, Ibn Battuta Mall, Jumeirah Village and Dragon City. Two are currently open and operational, with the rest at various stages of construction and development. Book your hotel in Dubai and around the world in 55 countries at best rates available. Pay at the hotel. Book now at HotelWorlds.com!